Joint committees include members from both houses of Congress, Parliament, or any ruling body. They focus on a particular issue, such as economics or taxation. They enhance communication between the two bodies. The committee's leadership usually alternates between the two bodies, as well. In the U.S. Congress, there are four joint committees. They are the Joint Economic Committee, the Joint Committee on Taxation, the Joint Committee on Printing, and the Joint Committee on Libraries. They are all standing committees, which means they are permanent. The Joint Economic Committee advises Congress on economic issues. Its primary tasks are to review economic conditions and recommend improvements in economic policy. It does this by holding hearings and commissioning studies that give members of Congress information about specific economic trends and events. That gives our elected officials the knowledge to vote on the thousands of bills they review each year. The Committee requires the Chair of the Federal Reserve to report on the state of the U.S. economy and explain current monetary policy. The Chair must answer questions from Committee members. It must justify its actions, and reveal what it expects for the economic outlook. The Employment Act of 1946 created the JEC to provide economic expertise to Congress. It created the Council of Economic Advisers to do the same for the president. The JEC reviews the CEA's Economic Report of the President. It then creates an annual report that addresses the points contained in the president's report. That provides an alternative view of the economic outlook that Congress uses in the budget process. The JEC has 20 members divided evenly between the Senate and the House of Representatives. The majority party of each house has eight members, while the minority party has six. Most important, the Chairmanship alternates between the Senate and the House every Congress. That normally means it alternates between the Republican and Democratic Party. That's because it's rare for the two houses of Congress to be led by the same party. As a result, the JEC is often politically motivated. Its reports attack the president's policies when the opposing party holds the chairmanship. It supports them when the same party holds it. But its reports and data still provide important knowledge if you ignore the politics. Similarly, the reports of the Senate and House side vary in topic and approach. The Committee affects the economy by highlighting issues that are of concern to various legislators. The reports and hearings it commissions inform decisions made by legislators about bills and the budget. Since the JEC serves your representatives, it may be more provincial in the economic issues it covers. For example, it might highlight trade protectionism and dumping to protect local industries. In addition to how the JEC affects the economy, it can affect you by providing information about various economic issues. Since the JEC leadership changes each year, your best bet is to Google “Joint Economic Committee” to find the active website for the leader that year. In 2017, the Committee reviewed President Trump's tax plan. It said the Tax Cuts and Jobs Act would increase the deficit by $1 trillion over the next 10 years. The JCT estimated the tax cuts would increase growth by 0.7 percent annually. That growth would reduce some of the revenue loss from the $1.5 trillion in tax cuts. The Joint Committee Staff interacts with Members of Congress, Members of the tax-writing committees, and their staff on a confidential basis and enjoys a high level of trust from both sides of the political aisle and in both houses of Congress. Because the Joint Committee Staff is independent, tax-focused, and involved in all stages of the tax legislative process, the staff is able to ensure consistency as tax bills move through committees to the floor of each chamber, and to a House-Senate conference committee. Congress created the JCT in the Revenue Act of 1926. Its staff consists of Ph.D. economists, attorneys, and accountants. The Committee is chaired on a rotating basis by the Chairman of the Senate Finance Committee and the Chairman of the House Ways and Means Committee. During the first session of each Congress, the House has the Chair and the Senate has the vice-chair. They reverse roles in the second session. The Joint Committee on the Library oversees the Library of Congress, the National Statuary Hall Collection, the U.S. Botanic Garden, and works of fine art in the Capitol. 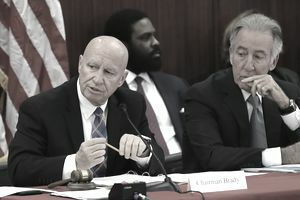 It holds hearings on policy issues and on members of the Committee on House Administration, the chairman of the House Appropriations Subcommittee, and the chairman and four other Members of the Senate Committee on Rules and Administration. It was created on January 26, 1802 (2 Stat. 129), making it the oldest continuing joint committee of Congress. The Joint Committee on Printing oversees the operations of the U.S. Government Publishing Office. The GPO is the printing press for federal agencies. Its purpose is to minimize the government's printing costs. Its members include five Representatives and five Senators, the panel It was created by the act of August 3, 1846 (9 Stat. 114; 44 U.S.C. 101).